X-Files was something of a cultural touchstone for Trail. She delights in shows about sasquatch, aliens, ghosts, and lost magical treasures. While no true believer, she views them much as she does the lottery; incredibly unlikely, but with ardent hope and excitement that something wonderfully fantastic will occur. I, on the other hand, am too ruled by critical skepticism to have that sense of excitement. None the less, I enjoy them as imaginative fantasy. Winding our way south through the deserts of New Mexico, Roswell was calling to us. A childhood touchstone for Trail and a point of cultural curiosity for me. Would we experience mind-blowing alien contact or just a lot of shoddy tourist attractions? The truth it turns out, is rarely exactly what you expect. Roswell, like a lot of desert towns, is spread out. Land is cheap and rarely bounded by natural obstruction so you get endless strip malls and suburbs rather than a concentrated downtown. 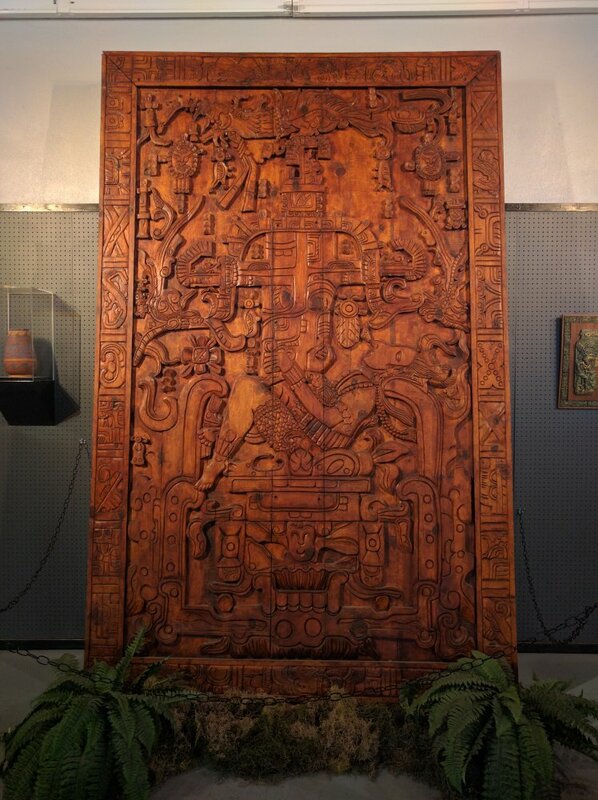 The hub of alien culture which the town is famous for is located in the historic heart of the town. There are no high rises but many historic buildings. One such older building now houses the International UFO Museum and Research Center. 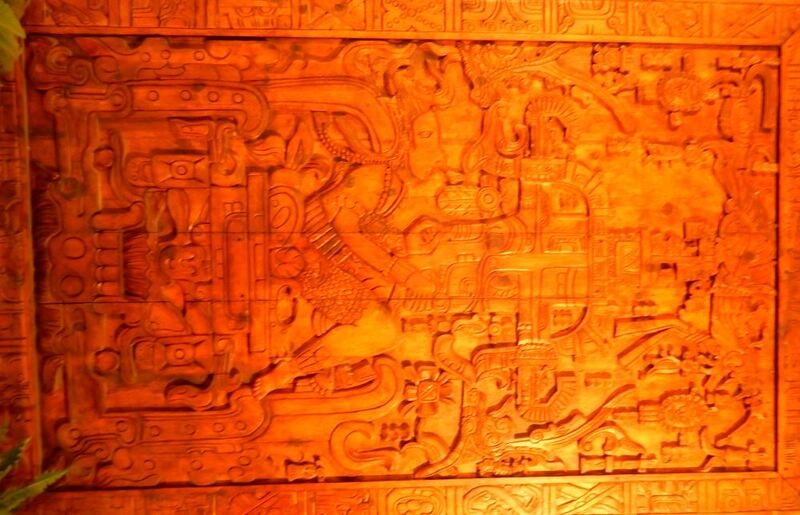 A reproduction in wood of a Mayan carving purported by some to depict a visitor from another planet. To date, every UFO related place we have stopped has been a disappointment. Outside they may have some cool signs, but when you get there it’s little more than some careless artwork and cheap plastic toys for sale. Fortunately, while the International UFO museum has its share of both those things, it actually has quite a bit more to offer. About a third of the museum is focused specifically on the famous Roswell incident. 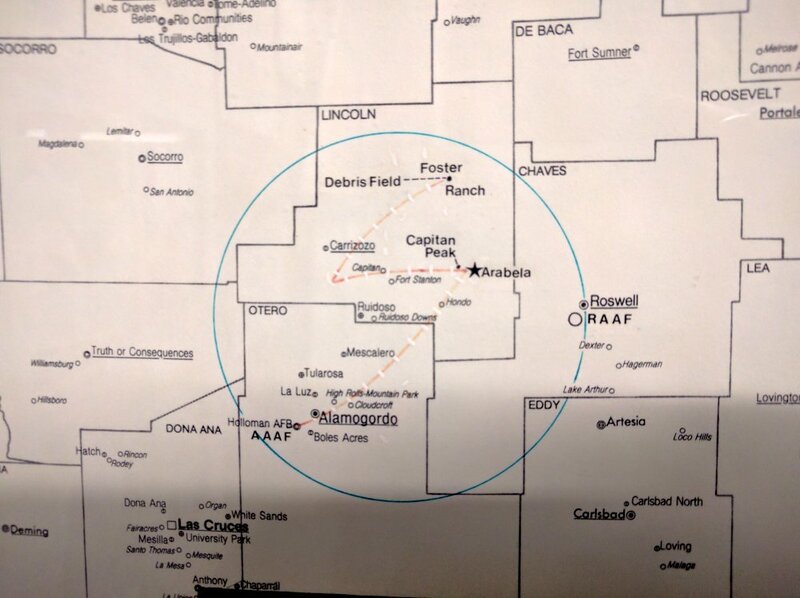 After discovering some debris on a local ranch, the US military declared publicly through the newspaper they had found the remains of a crashed flying saucer. Not long after they recanted the claim and instead declared it to be the remains of a high-altitude balloon involved in defense research. Conspiracy theories have been swirling ever since. The museum does a great job laying out the context under which the announcement was made; a rising tide of interest in saucer sightings. Then it covers all the known facts about the incident in great detail. Finally, it presents artifacts and arguments both for the case for it being aliens and against. Not surprisingly, I found the case against far more substantiated and plausible. Nevertheless, both were presented in great detail and without editorial judgment from the curators. 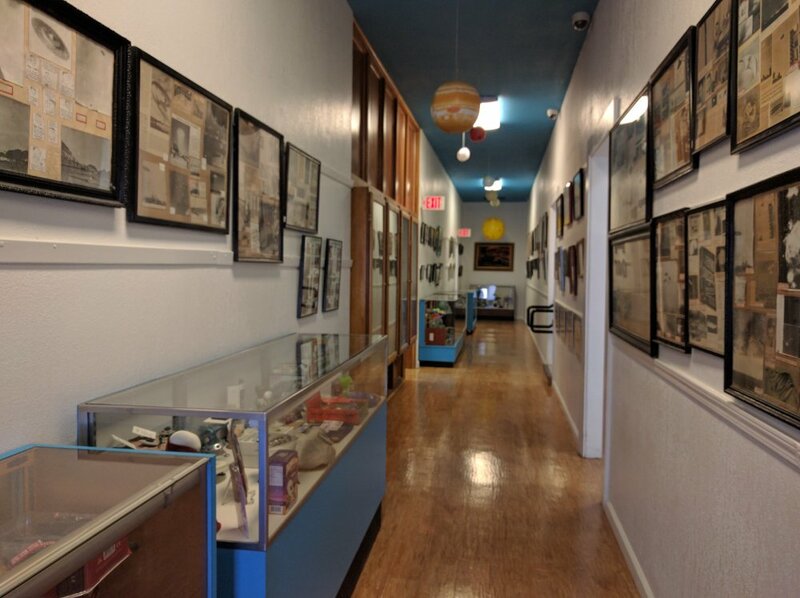 Another third of the museum proper was dedicated to the broader UFO phenomenon and had displays detailing eyewitness accounts, photographs, and competing theories. A good survey of the alien culture landscape but not a lot of detail. The final third was focused on art inspired by UFO culture. A real standout is a life-size diorama of Greys greeting us with a classic flying saucer suspended overhead. Periodically smoke, light, and sound blasts forth from it to bring the thing alive. Not spectacular exactly, but charming in its way. 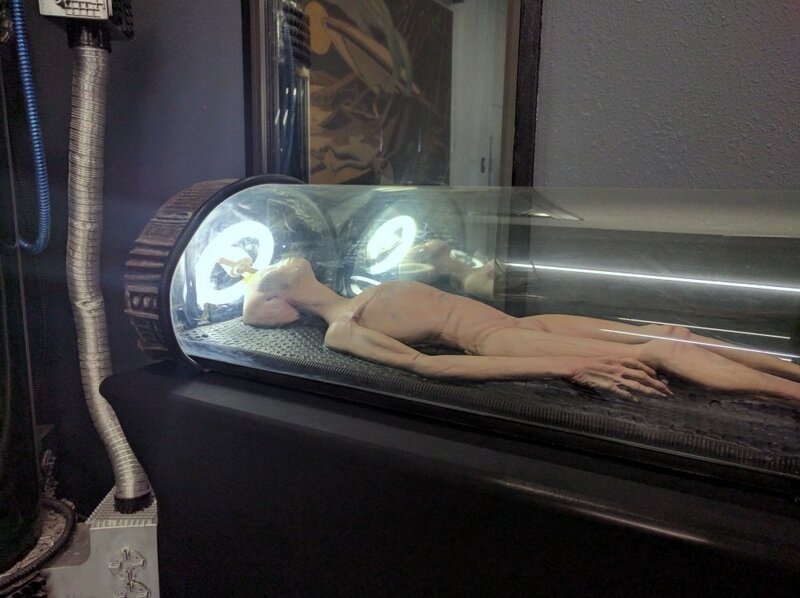 Mixed in with the art are movie memorabilia including an autopsy scene used in the TV movie Roswell. The UFO Museum? 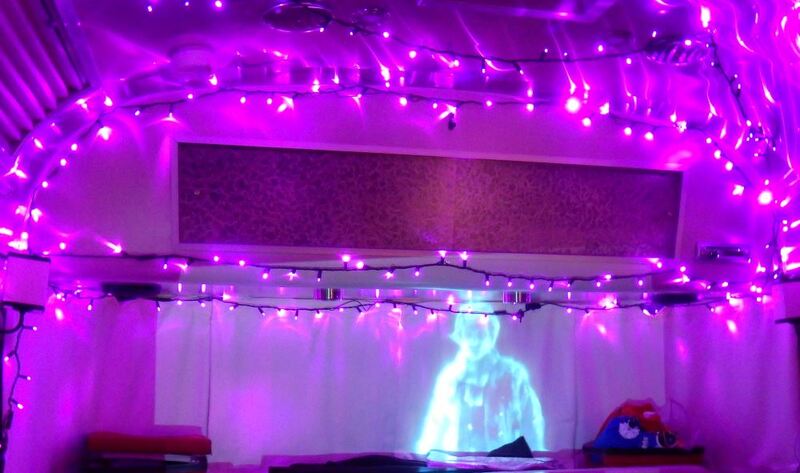 No, its just Halloween in the Airstream with Trail and Hitch. Both Trail and I enjoyed the museum, but it was the Research Center that really intrigued and impressed me. 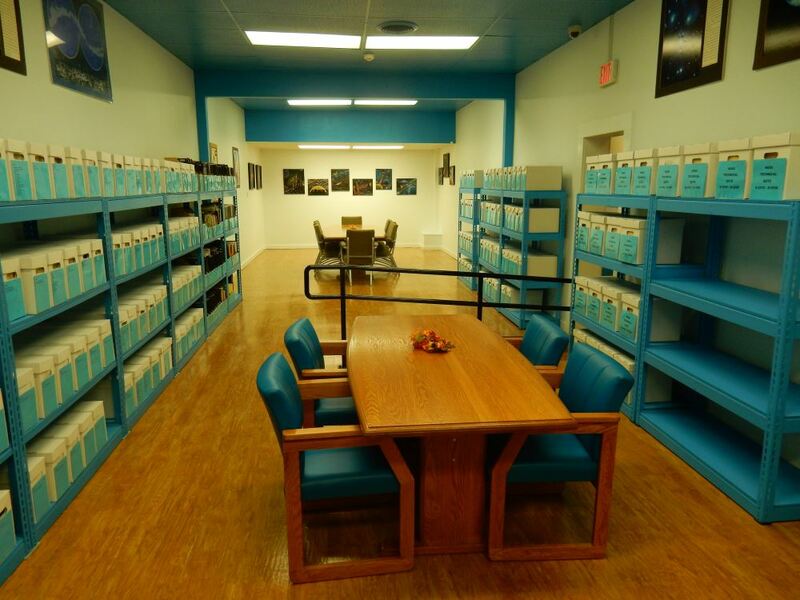 Located next to the museum it is primarily a library dedicated to UFO research. 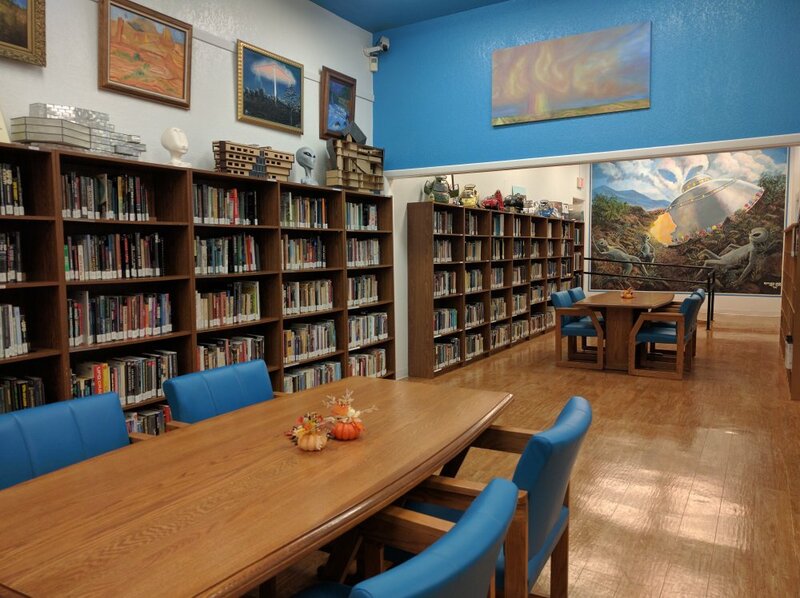 They have a pretty healthy book collection that covers both fiction and nonfiction works related to the UFO phenomena. Another room contains an extensive collection of well-organized periodicals and government documents. Computer stations allowed access to the catalogs for all this material as well as for internet research. 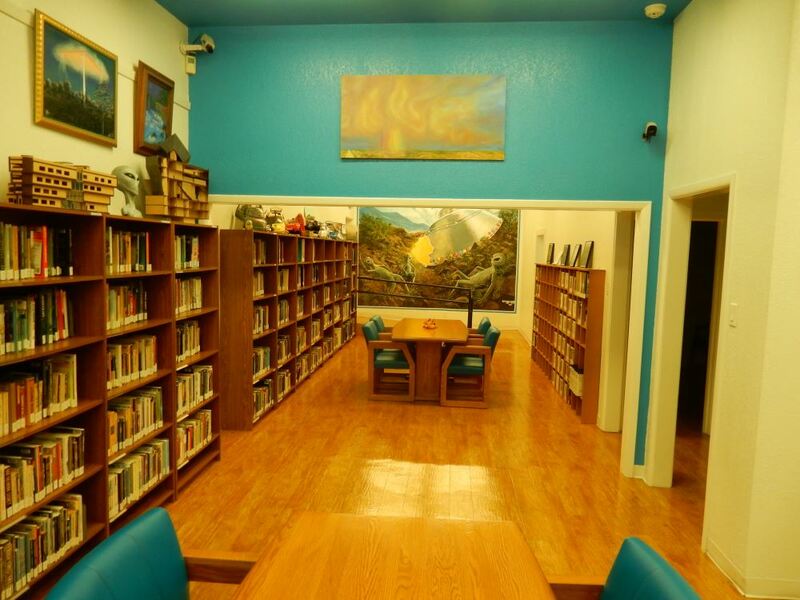 There were both public areas for reading and private rooms for presentation or study. The art collection also spilled into this space, but the quality of art was noticeably better in many cases. They also used some of the space to display a private collection of science fiction themed toys. One of my favorite items was a collection of architectural models done by local students imagining a future home for the museum and research center. We were both drawn to the place and tempted to plunk down and spend a day just reading and researching the archives. A fantastic environment for study. All in all, the UFO Museum was worth the asking price, especially considering how cool their research center was. I wasn’t too impressed with the gift shop, but I’m not one for souvenirs. They did have a lot of audio and videos unique to the museum which true enthusiasts might find intriguing. A cozy place to do some research on the UFO phenomena. Aliens rule the friendly streets of Roswell. Outside the museum, there are Alien themed shops every which way you look. It’s a nice promenade for window shopping and curiosity-seeking. Very near the museum, we found a Mexican bakery filled with tasty pastry delights at stunningly low prices. We stocked up with cookies and other baked goods we’d never heard of to take back to the trailer with us. We also visited a local game store: Pair-a-Dice Game Shack where we talked with the owner about the local gaming scene (mostly card games) and the general challenges of running a small shop. 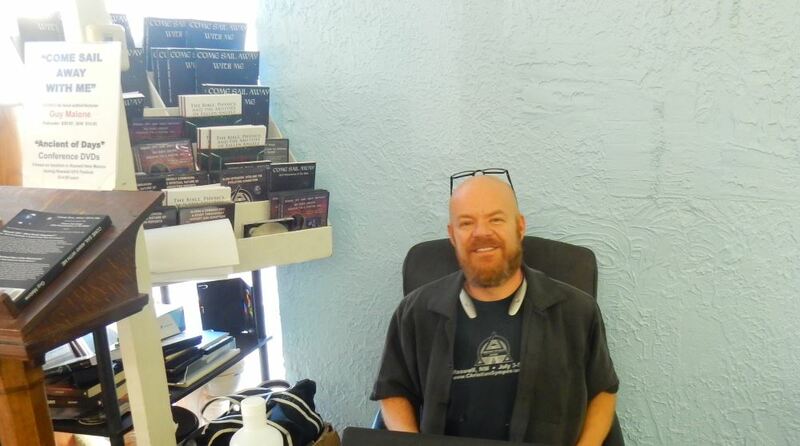 Like nearly every game store owner he was very engaging and sociable. I don’t often write about it but we generally visit any hobby game store we come across in our travels. The periodicals room is quite nice, lots of FOIA papers, journals, and NASA documents. Jesus, Gems, and Aliens Oh My! Trail and I also both have a fondness for pretty rocks so we peeked in on a combination rocks shop and Christian bookstore called Ancients of Days. They had a few very nice large specimens as well as a backlight phosphorescence room which was a treat. Most curious was a man by the name of Guy Malone signing/selling a book he had written about Roswell. Being the skeptical sort I am, I didn’t want to engage him directly about the content of his book so I asked him questions about his writing work in general and we discussed monetizing blogs for a bit. Later I looked him up. It turns out his books make the case for the Roswell crash and other UFO abductions to be evidence for fallen angels, aka demons who torment those who are spiritually vulnerable. By following Jesus and protecting yourself in the proper ways, those suffering such torments as UFO visitations can be relieved of the burden. It certainly broadened my awareness as to the full range of UFO culture ideas and inspirations. Further research showed there is a whole community of Christians interpreting UFO experiences in this way. Here is the friendly author Guy Malone signing his book, Come Sail Away With Me. So it was that we, loaded with Mexican pastries and newfound knowledge of the UFO universe, returned to our space age Airstream leaving the strange yet charming mecha of Alien tourism behind. On our return, we loaded up Close Encounters of the Third kind followed by some stargazing to round out the experience. We didn’t see any UFOs but there were plenty of mysteries and wonders to behold in the desert night sky. So enjoyed your Roswell outlook, but I must say , I am also a sci-fi freak. Where ever you are today, Happy Thanksgiving and stay well. Thanks Gerry! I’m a sci-fi fan too. Have a happy Thanksgiving and safe travels!